Coca-Cola is looking to get interactive with fans during the Super Bowl. Fans will have an opportunity to plan an online game leading up to and during Super Bowl XLVII. 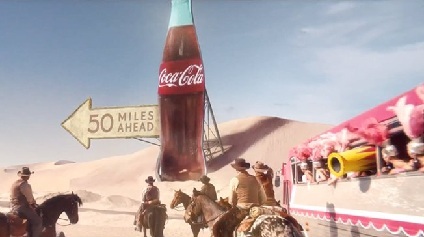 The online game pits three fictitious teams—cowboys, show girls and “badlanders”—against one another in a desert race to reach a bottle of the brand’s classic sugar water. Anyone who wants to play can use computers, tablets or smartphones to vote for their preferred team on the campaign website, CokeChase.com. There, players can also sabotage—in other words, vote down—the teams they oppose. After the Super Bowl is over, based on the outcome of the online game, Coca-Cola will also air one of three possible 30-second spots airing after the final whistle of the football game. Tags: Advertising, Adweek, Coca-Cola, Super Bowl XLVII. Bookmark the permalink.